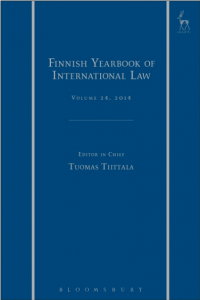 The Finnish Yearbook of International Law (FYBIL) welcomes unsolicited contributions related to international law throughout the year. A submission should be original, unpublished, not under consideration for publication elsewhere, and should not exceed 15,000 words in length including footnotes unless justified by the subject matter. The manuscript, an abstract of about 100–250 words along with up to six keywords, and the author’s curriculum vitae should be sent to the Editor-in-Chief at fybil@fsil.fi. At a later stage of the review process, the author is asked to make sure the article follows FYBIL’s style guidelines. FYBIL welcomes reviews of recently published books on any aspect of international law. Book reviews should be around 1,500 to 2,000 words in length including footnotes. They should provide an analysis of the author’s central argument and approach, rather than a simple synopsis or précis of the content of the book. Book review essays of up to 5,000 words can compare and contrast the arguments of several books or engage in depth with a single book. Potential reviewers should, in the first instance, contact the Book Review Editor at fybil-reviews@fsil.fi to express their interest in reviewing a particular book. The Book Review Editor will then seek to obtain a copy of the book from the publisher. Potential reviewers are kindly requested not to contact publishers on behalf of the Yearbook. Books for review are welcome and may be sent to the address below.